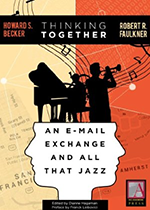 Sometime before June 2003, Robert R. Faulkner (Rob) and Howard S. Becker (Howie), sometimes addressed by Faulkner as “Count,” started thinking seriously about a project to study jazz improvisation and the repertoire of jazz players. Since Faulkner lived in Massachusetts, on the East Coast of the North American continent and Becker lived on the West Coast, they did almost all their work together by e-mail, except for a few meetings face-to-face. The correspondence continued for several years, and their book, Do You Know? The Jazz Repertoire in Action was published by the University of Chicago Press in 2009. A French translation, Qu’est-ce qu’on joue, maintenant ? (La Découverte: Paris, 2011) followed. In the fall of 2010, Becker and his wife, the photographer and writer Dianne Hagaman, spent three months, as they customarily do, in Paris. One day Becker received an e-mail from a conceptual artist and poet named Franck Leibovici, who had read Becker’s earlier book Telling About Society and thought they had some interests in common. They did, and Dianne and Howie got to know Franck. Who soon invited them both to contribute to a large project he had underway at Les Laboratoires d’Aubervilliers, called des formes de vie. He explains the details of this in his preface to this book. Becker wrote to Faulkner about this possibility, who was immediately enthusiastic. Becker pasted all the e-mails together and sent the result to Leibovici, who was equally enthusiastic. The piece was one of a hundred that formed the corpus of the work that became the finished project (if a project like this can ever be said to be finished). Fragments appeared on two pages of the book documenting the project, (des forms de vie): une écologie des pratiques artistitques (Les Laboratoires d’Aubervilliers and Questions Théoriques: Paris 2012). And Becker and Leibovici “performed” a part of the correspondence that had been translated into French, Leibovici reading the part of “Becker” and Becker reading the part of “Faulkner”. Leibovici decided that the appropriate way to display the correspondence would be in a book, but no obvious publication outlet came to light. Until Larry Gross, Director of the Annenberg School of Communication at the University of Southern California proposed that the Annenberg Press, one of the school’s activities, publish it as an electronic book. Everyone involved was enthusiastic. Even after they discovered that meant more work to do. The e-mails were not in what you could call tip-top condition. Many were missing dates and other identifying information, and the whole corpus needed to be gone over to make sure that it would be reasonably clear to readers other than the people who wrote them. Hagaman undertook this job and scoured the couple’s computers to find the most accurate set of originals from which to constitute an accurate account of the events that inspired and produced the major ideas of the book. Her meticulous work made sure that the materials were in the best shape they could attain. Becker and Faulkner read the complete version and made some minor editorial changes, occasionally changing names and taking other measures to protect the anonymity of people who had not known that they were participating in a research project (in fact, of course, for part of the time neither Becker nor Faulkner were completely clear that they were doing a research project). Leibovici proposed that the document include a sort of “soundscape,” made up of the tunes the two correspondents constantly referred to as they went about collecting the interviews, observations, and reminiscences that made up the bulk of the material they worked with. Electronic publication makes it possible to insert electronic references to such material and so, when a tune is mentioned for the first time in the correspondence, the title is clickable and the click takes you to a performance of that tune found on YouTube (which means that you will often get a short ad before the music begins). Otherwise, the e-mails are presented as they were written, including all sorts of informalities, jokes, personal references, etc. which we have not tried to annotate or explain. The semi-private language, we think, becomes understandable in a very short time. Along the way Larry Gross and Arlene Luck, the managing editor of the Annenberg Press, kept the project manageable, letting us know when some idea would not be economically or technically practical. All this proving that the old maxim is right: it takes a heap of people to make a book.